While working with her devoted therapists Howie and Barb, Carly reached over to their laptop and typed in “HELP TEETH HURT,” much to everyone’s astonishment. This was the beginning of Carly’s journey toward self-realization. 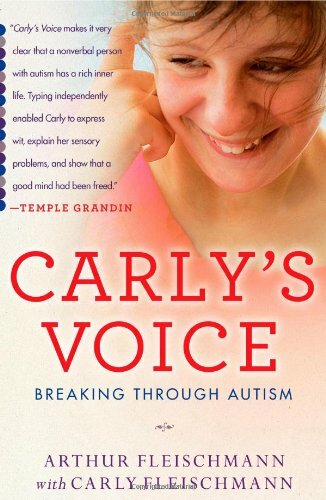 Although Carly still struggles with all the symptoms of autism, which she describes with uncanny accuracy and detail, she now has regular, witty, and profound conversations on the computer with her family, her therapists, and the many thousands of people who follow her via her blog, Facebook, and Twitter. In Carly’s Voice, her father, Arthur Fleischmann, blends Carly’s own words with his story of getting to know his remarkable daughter. One of the first books to explore firsthand the challenges of living with autism, it brings readers inside a once-secret world and in the company of an inspiring young woman who has found her voice and her mission.